Businesses nowadays are data driven and rely heavily on business metrics to determine if their strategy is adequate and pointed in the right direction. One metric that has garnered heavy use is the Return on Investment or ROI. ROI is an excellent way of establishing the value of an investment because it compares the cost of the investment against its benefits. As a rule, the goal of an investment is to bring in more value than the original cost; For example, a project or an asset investment can be considered successful if it is more beneficial than it is expensive. Calculating ROI is easiest if all the values are in dollars, which is why it is trickier to calculate the ROI of business components that do not directly generate revenue. An example of this is IT components; they do not directly make money, but the improvements they bring to business processes help maximize a company’s ability to generate income. One way to account for “soft” assets in the ROI computation is by comparing their cost against the earnings/losses stemming from the revenue-generating business component that they affect the most. Data backups don’t generate earnings for a business, and they aren’t necessarily viewed as “assets” outside of them being included in the asset protection procedure. For this reason, many financial managers measure the value of data backups by comparing their cost against the value of assets that could be lost if the backups are not in place. For businesses that have their own IT department, this is straightforward — it is just the sum of the cost of hardware (price of server or storage device + computers), cost of labor (hourly wage of technician x number of hours spent building server and conducting backups), and overhead (power + internet). For small-to-medium-sized businesses (SMB) that use managed IT solutions, this can be less straightforward, as data backups tend to be bundled with other services for a uniform flat fee. 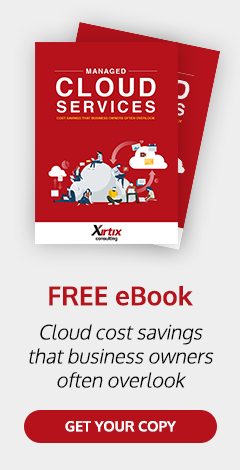 For instance, Xirtix’s XCare Managed Services — which include all aspects of managed IT that any SMB would need, including data backups — cost a flat monthly fee. Obviously, the actual fee for just data backups is but a fraction of this monthly fee, but most people simplify the process by using only the monthly figure multiplied by 12. This represents the cost of your managed IT (which includes backups) for a year. For many SMBs, it’s everything! Data is the lifeblood of most, if not all, SMBs in the digital biosphere. If your small business is in need of some form of IT management, then it’s safe to say that your data is worth that much. Imagine if your business loses all of its data. No more database, no more customer information, no more supply chain, no information on what you owe and how much is owed to you. There’s also no information on how well your product is selling, or how many visits your e-store generates per month. Do you still think you can run your business? This does not get any more straightforward, and it also explains why big companies spend thousands of dollars on in-house data management tools. For those that can afford it, a fully-powered IT department ensures that their business’s data is handled with utmost care, as data loss is directly tied to revenue loss. Data backups help ensure that a business can continue operating in the event of a disaster by minimizing lost opportunity for income (downtime costs). Managed IT services are far cheaper than buying and maintaining your own IT infrastructure, and they offer just as much protection and value, not to mention business agility, scalability, and flexibility. The last three are key for SMBs because of varying business conditions. For instance, some SMBs have seasonal business while others may experience quick growth. This is why it‘s valuable for small enterprises to partner with an IT provider that can stay abreast with their business speed. This also shows how valuable data backups are based on their cost versus the cost of potential loss.